The Dons host Kilmarnock at Pittodrie this Saturday in what is the final match before the first international break of the season. 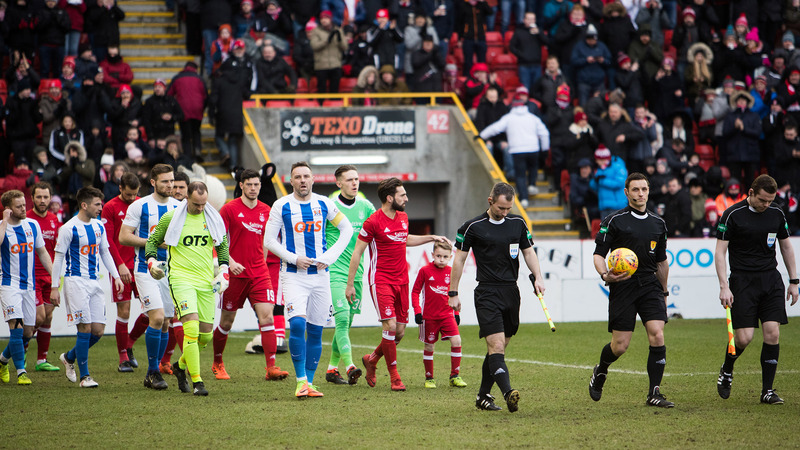 Derek McInnes’s side nearly grabbed all three points at Easter Road last time out, but a late strike by Jamie MacLaren meant the reds left the capital with a share of the spoils. It’s been a tricky start for The Dons with the draws against Rangers and Hibernian either side of the victory at Dens Park. Kilmarnock are on four points from their opening three games having beaten St Johnstone on the opening day before a goalless draw with Livingston and a loss to Hearts last week. Last season Steve Clarke significantly revived the fortunes of Killie as he took them from the basement of the Premiership to a more than respectable 5th place. However, the Ayrshire men were unable to defeat Aberdeen in the six games between the sides as The Dons knocked Killie out the cup on penalty kicks. It’s been a busy week at Pittodrie as The Dons announced Derby County defender Max Lowe joined on loan until January. The left back has been on Derek McInnes’s radar for a number of months and The Dons manager spoke to the press about the signing as well as looking forward to the Kilmarnock match. Kilie also announced the loan signing of Greg Stewart – who was on loan at Aberdeen last season. “He’s here to be involved and trained very well today. He played part of the game on Tuesday and had a hard training session at Derby on Tuesday. The intention is to come here and be involved and whether that’s from the start on Saturday remains to be seen. “I knew about it probably two days ago and as soon as the interest was there I tried to push it. The Gaffer at Derby has been great with me by letting me out to try and get some games under my belt. “I want people to talk about me in the right way. The likes of James Maddison is now starting in the Premier League for Leicester and he came to Aberdeen done well, got back to Norwich and earned a move to the Premiership so I’d be happy to follow in his footsteps. “I’m an athletic full back, aggressive up and down and want to get forward. I’m fit. If he puts me in on Saturday I’m ready and I’m waiting for an opportunity. “Today with the training session the lads have been very welcoming. If I’m needed on Saturday, I’ll be ready, and I’ll wait my time for when the opportunity comes. 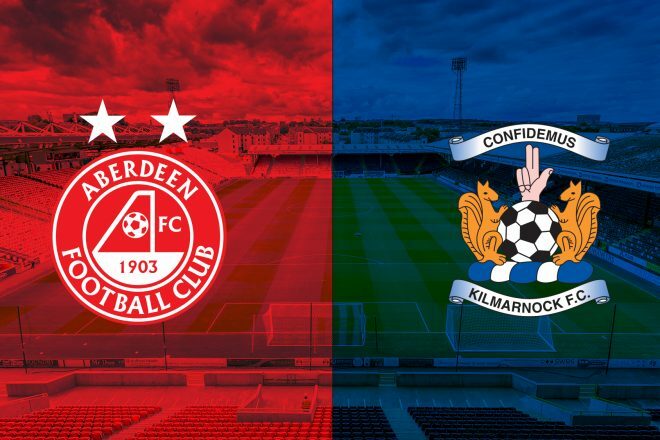 Kilmarnock come to Pittodrie with the knowledge they haven’t beaten an Aberdeen team since December 2012, when Liam Kelly’s double meant Killie returned to Ayrshire with all three points. Until last season’s 1-1 draw at Pittodrie, Derek McInnes had won on every occasion he had faced Kilmarnock as Dons boss. Last season produced two draws between the sides, with the Scottish Cup quarter-final in March going all the way to penalties after a draw in Aberdeen. Of all the opponents Derek McInnes has led The Dons out against, has the best record against Kilmarnock. The Dons have won sixteen times in the league out of seventeen against Killie, scoring 39 goals and conceding just nine. On three occasions Aberdeen have won by four goals, with two 4-0 wins at Rugby Park and a 5-1 victory at Pittodrie in 2016. Last season Steve Clarke produced a remarkable revival at Rugby Park, with Killie rising from a relegation scrap to a comfortable top-six finish but were unable to gain the upper hand over The Dons in each match. The overall record between the teams is also favourable for the men in red with 119 victories over Killie’s 77. If you are unable to make the game on Saturday make sure to tune into RedTV from 2.45pm with Dave and Andrew. Video coverage will be available to international subscribers and post match we will have reaction, highlights and a full match replay. Enjoy the game and Stand Free! An early bath for Michael Devlin after just 3 minutes set the tone for the match as Aberdeen were forced to play on the counter against a well organised Kilmarnock side who produced two moments of quality to win the match thanks to goals from Brophy and Stewart. Derek McInnes made three changes to the side which took a point at Easter Road last week. Shay Logan and Niall McGinn were re-called to the starting line-up in place of Dominic Ball and Frank Ross who dropped to the bench. 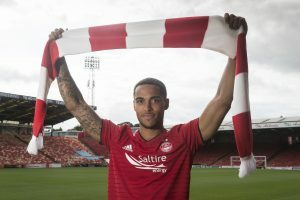 Max Lowe made his Aberdeen debut replacing Tommie Hoban who missed out through injury. The Dons were put on the backfoot almost immediately when they were reduced to ten men in the 3rd minute of the match. The dismissal came when Brophy flicked the ball past Devlin 40 yards from goal, the touch left the striker with plenty to do but the referee decided to produce a red card for a last man challenge after Devlin pulled Brophy back. From the free-kick Lewis had to be alert to deny Brophy with a fine save. The red card forced a change and Ball replaced Gleeson who had barely had a chance to get a touch of the ball. The Dons had to regroup quickly with all the pre-match plans out the window and settled into a 4-4-1 formation. Brophy managed three attempts on goal in the opening ten minutes and the third almost ended in a spectacular goal but thankfully his 30-yard strike cannoned off the angle between post and bar before heading out to safety. After a frantic fifteen minutes The Dons began to exert some pressure on Kilmarnock high up the park which offered plenty of encouragement to the home support but they were unable to test MacDonald. Power received a yellow card after a great energetic run from Shinnie who had broke up the play inside his own half before linking up with May. The captain then spun away and was pulled back by Power 40 yards from the Kilmarnock goal. In the 27th minute Lewis was called into action when a through ball from Tshibola to Burke got inside Lowe, the winger tried to skip past the keeper but Joe did well to thwart him with a brave interception. On the half-hour mark Ferguson caught Tshibola in possession on the edge of the area and the Kilmarnock man retaliated with a poor challenge which cost him a yellow card. From the free-kick McGinn looked to have produced a moment of real quality but it was matched by a magnificent save from MacDonald who moved quickly to tip the ball over the bar. Just a couple of minutes before half-time Shinnie was adjudged to have fouled Stewart 30 yards from goal. The Dons were collectively enraged by the decision, primarily because it looked as though O’Donnell had handled the ball in the build-up. The free-kick was taken by Brophy who looped the ball over the wall and into the bottom corner of the net leaving Lewis with no chance. It was a great strike but the manner of the decision to give the free-kick caused uproar inside Pittodrie, particularly in the Dons dugout and Craig Thomson took the decision to have a word with Derek McInnes, a move which the Red Army were quick to voice their disproval of. After a thoroughly frustrating half The Dons headed into the half-time break one goal behind. When they re-emerged for the second half Aberdeen retained the same shape and personnel to try and overturn the deficit. Shinnie won a free-kick in the 49th minute when he was brought down by Findlay on the touchline. From the free-kick Logan got up at the back post but his header ended up over the bar. In the 54th minute Kilmarnock had a free-kick of their own 25 yards from goal after Ferguson fouled Jones and received a yellow card for his trouble. There was no repeat of the first half as Brophy’s strike was deflected over the bar. Moments later the striker picked up a yellow card for timewasting. The striker continued to cause problems for The Dons as he got in behind the defence once again and unleashed a powerful strike towards goal which Lewis tipped round the post. With 35 minutes remaining Aberdeen were struggling to get going with Kilmarnock using their extra man well in the opening stages of the second half. The supporters were offered a bit of encouragement when a long diagonal from Logan fell into the path of May, the striker did well to get the ball under control and unfortunately dragged his shot wide of the post. With half an hour remaining McGinn was replaced by Cosgrove as The Dons looked to go a bit more direct and provide additional support to May up front. The Dons had half a chance to get back into the game when Mackay-Steven broke down the right and clipped the ball into the area but it didn’t fall kindly for Cosgrove. From that attack the ball was cleared up the pitch for Stewart to collect on the halfway line, he turned Considine quickly and began an unstoppable run towards goal before clipping the ball over Lewis and into the back of the net with twenty minutes of the match remaining. Kilmarnock almost made it 3-0 when Jones skipped away from Shinnie down the right before attempting to slide the ball past Lewis at the far post but the goalkeeper got down well to turn it round the post. With 25 minutes of the match remaining May was replaced by Anderson. In the 77th minute Anderson created a half chance for Cosgrove when he received the ball to feet on the edge of the area before laying the ball off for his strike partner. Cosgrove could not direct the ball towards goal with his left foot. 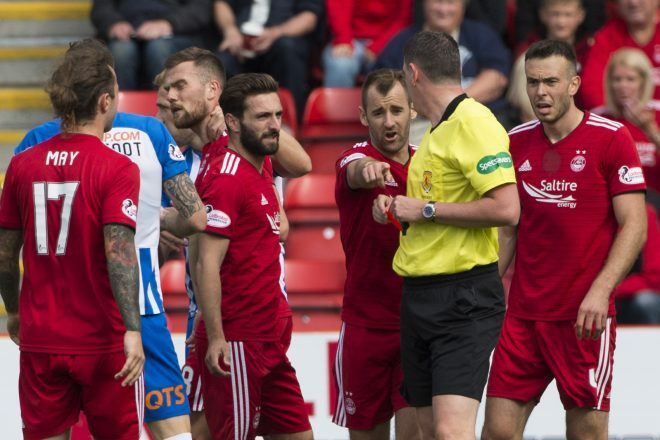 Kilmarnock were frustrating Aberdeen as the clock ticked towards full-time and Graeme Shinnie picked up a yellow card after contesting some perceived time-wasting a bit too vigorously. Logan followed the skipper into the book picking up a yellow card of his own after losing possession inside his own half. As the 90 minutes drew to a close Anderson had a half chance after Cosgrove won the ball in the area but he couldn’t keep the volley down and on target. The youngster had another half chance as the board for added time was being prepared but this time he couldn’t keep the volley down on his right foot. Two minutes of additional time were to be played with the remaining home supporters staying in hope rather than expectation as the visitors ran out winners. A tough day at the office for The Dons.